WHY GO: Do you want to “do” Acadia National Park, but don’t want to deal with the multitudes that converge on Bar Harbor each summer? Then stay on US 1 North about 20 miles from where the crowds veer off, and hook a right onto Route 186 to the next peninsula, Schoodic. Infinitely more more secluded, Schoodic encompasses 3,500 additional acres of Acadia National Park, with ferry and bus access to the bulk of it on Mount Desert Island. 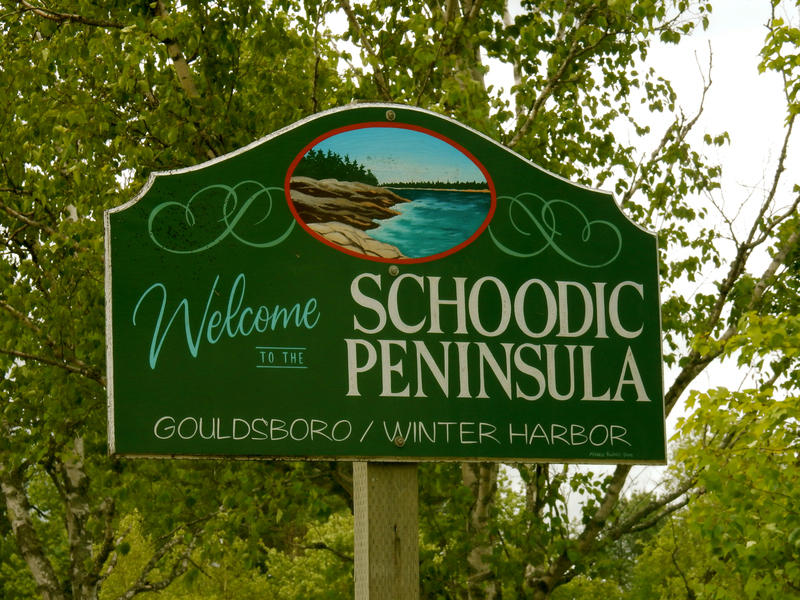 The small towns of Winter Harbor, Birch Harbor and Prospect Harbor are all located on Schoodic, so on this Getaway, you’ll experience nature in its rustic glory, and if you’re game – a few “Pickled Wrinkles.” And of course, some comfy beds and pretty places to rest your head. 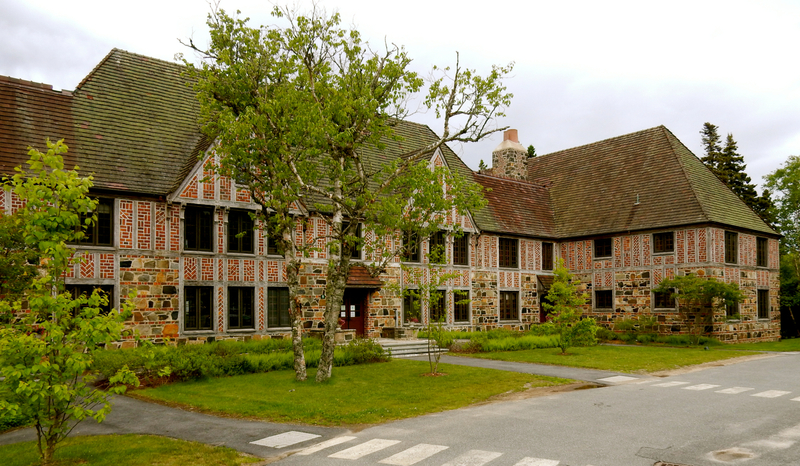 TOUR: Schoodic Institute. 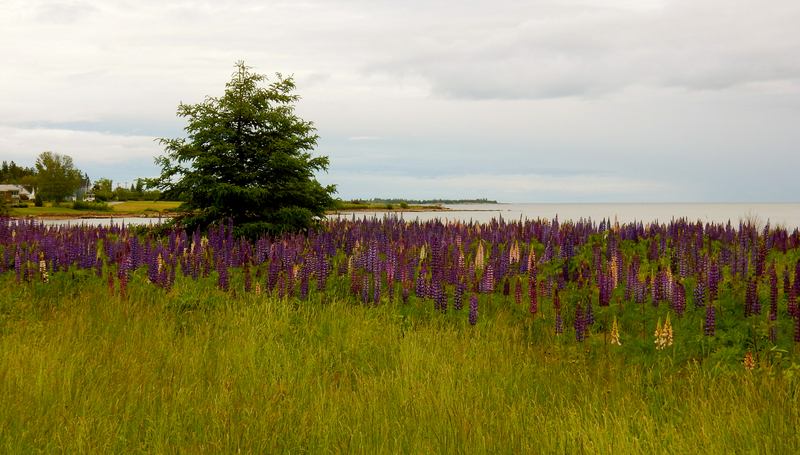 Most people arrive here for weeklong programs, like Birding Tours, “Citizen Science” opportunities, or Art In Residence. 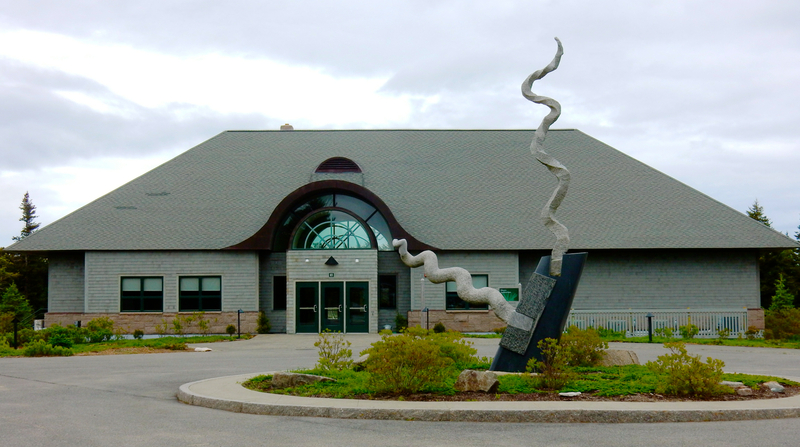 But even if you visit for the day, stop into the magnificent Schoodic Institute Welcome Center for an interactive overview of the area, history, and research done here, and of course, to ogle the striking architecture. This multi-hued stone structure, a gift from J.D. Rockefeller, was built in 1933 for the US Navy, which at the time (1919 to 1933) was operating it’s “listening station” from what is now Acadia National Park’s Otter Cliffs. Rockefeller wished to preserve Mount Desert Island strictly as a National park, so he funded this Naval Office to be built on the peninsula nearby. 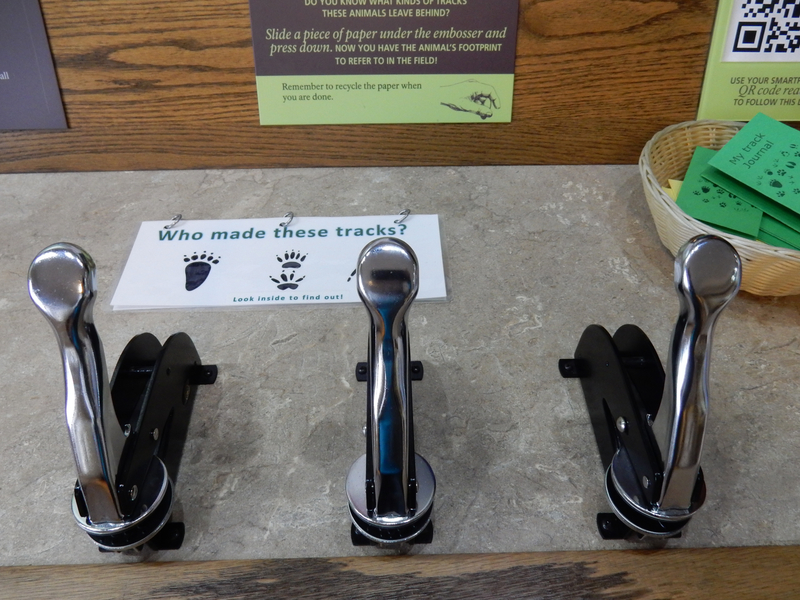 Besides the engaging exhibits at the Welcome Center, visitors can take advantage of free drop in programs run by the Schoodic Institute in Acadia National Park. Or sign up for the annual “Bio-Blitz” weekend in July – a Biodiversity Study weekend inviting the public to help collect and document research being done here. Open daily 10-4, free. DRIVE/BIKE: Five-Mile Schoodic Loop Road. 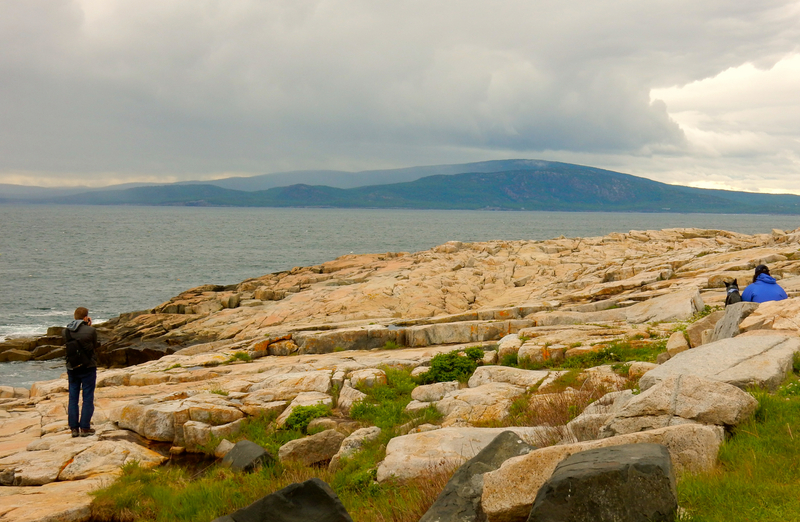 It’s the true edge of the world out here, especially on Schoodic Point, where chances are you’ll be one of just a few people meditating on the ocean and rocky cliffs. 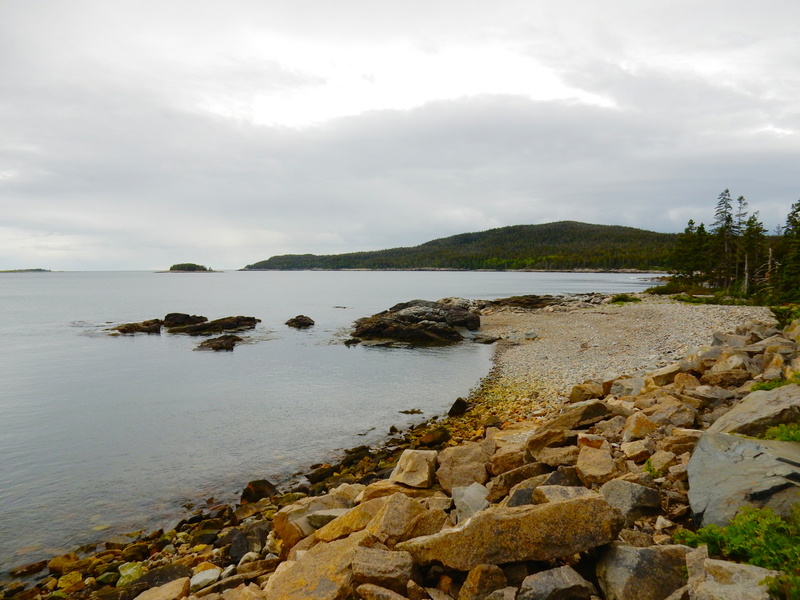 For now, this section of Acadia National Park sees little traffic. Come out here before that changes. HIKE/CAMP: Acadia National Park. There are 3,500 acres of National Park on the Schoodic Peninsula, and you can hike out to Schoodic Point and camp out at Schoodic Woods (tent and trailer). FERRY TO BAR HARBOR: Both the Bar Harbor Ferry and Schoodic Ferry take people (not cars) between Winter Harbor and Bar Harbor. Some claim that this one-hour cruise is one of the most picturesque on the Maine Coast. Once in Bar Harbor, you can take the Island Explorer Shuttle Bus, with drop-off points throughout the National Park, for free. EAT: Pickled Wrinkle, Birch Harbor. 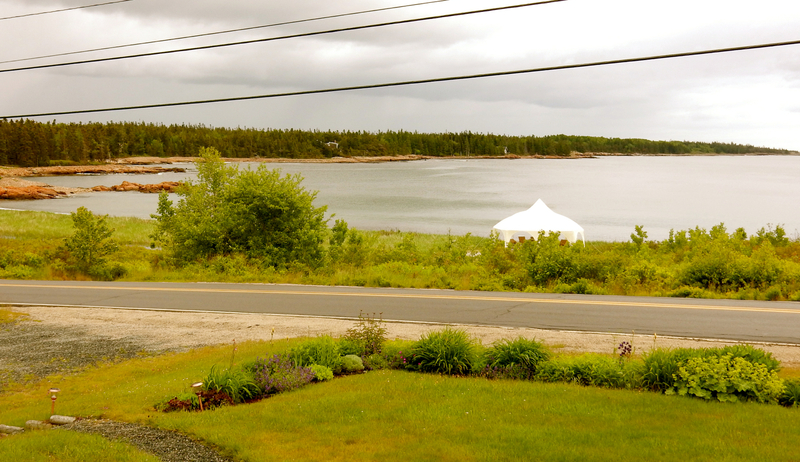 Three miles from Acadia Oceanside Meadows Inn (see below), the specialty here is the restaurant’s namesake, Pickled Wrinkles. An old Downeast delicacy, these sea snails (whelks) fed poor fishermen in tough times, offering a quick and easy way to get protein when food was scarce. Boiled and pickled in vinegar, these things are an acquired taste for sure. Order them if you dare ($4.95 for 4). If you seek a more VEGAN seafood experience, try the Fried Wild Dulse – seaweed chips ($4.95) – fine if you like your food ultra-salty. You’ll find very good burgers, salads with greens from local farm, and small pizzas. The Lobster Flatbread ($8.50) is very good. And I’d return repeatedly for the “Rhubarb Streusel” – more like a cobbler, warm and indescribably delicious. EAT: Locals also recommend Two Sisters Deli in Prospect Harbor and Fisherman’s Galley in Winter Harbor. 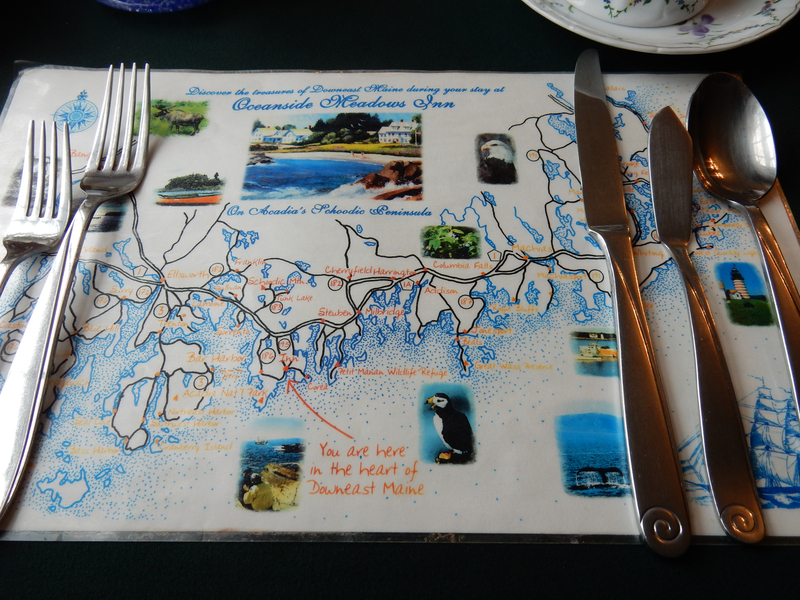 STAY: Acadia’s Oceanside Meadows Inn, Prospect Harbor. On 200 diverse acres, this fantastic place is not just an “inn:” it’s a nature preserve, a lecture/event hall, and beach all in one. 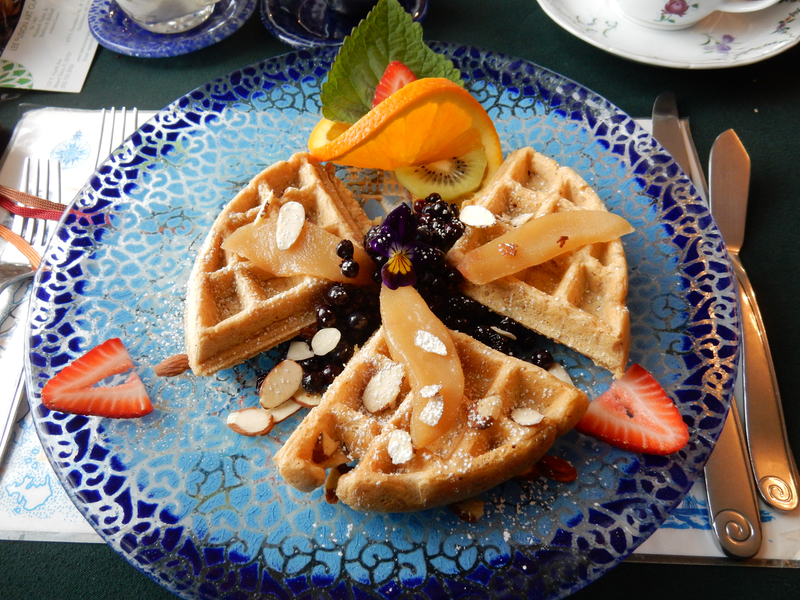 Plus, it offers one of the most beautifully presented and delicious B&B breakfasts I’ve ever seen and tasted. FYI – this Inn is Vegetarian, so do not expect a Farm Breakfast with Sausage and Bacon. You will get, however, one of the most beautiful breakfasts a B&B can offer. “Check-in” occurs while seated on the couch in a lived-in parlor, where innkeeper, Ben (or his son or daughter), hands over a bundle of laminated property Trail Maps and Nature Guides and offers an overview of each one. 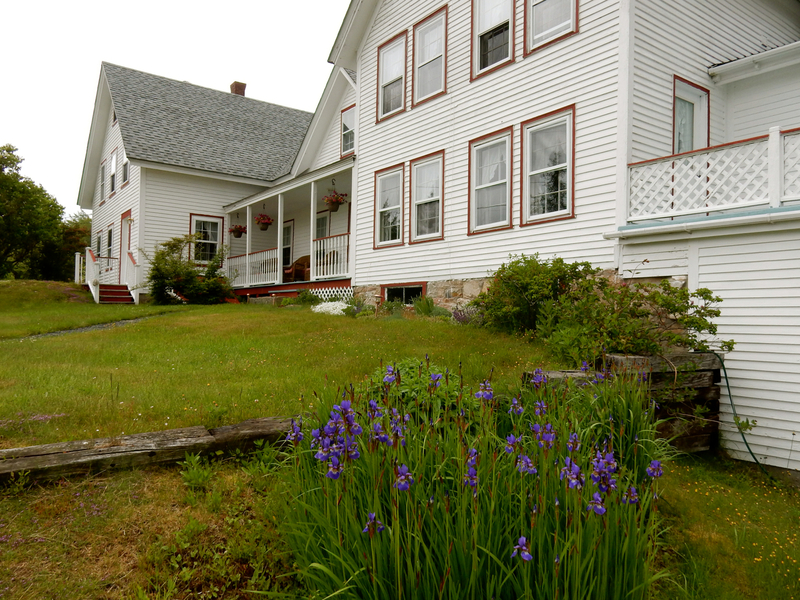 The inn’s property encompasses rocky shore, sandy beach, salt marsh, meadows and fresh water ponds (with beavers!) and is one major reason visitors from “away” keep coming back here year after year. Given time, I would have taken the 40 minute “Salamander Trail,” or three mile “Heron Trail” out to salt marsh to look for moose or bald eagles, painted turtles, herons and water snakes. But I was happy just to read the “Introduction to the Seashore Right Outside Your Window” since I merely had to look outside my own guestroom window to view the shoreline. As I checked in, repeat guest were arriving. 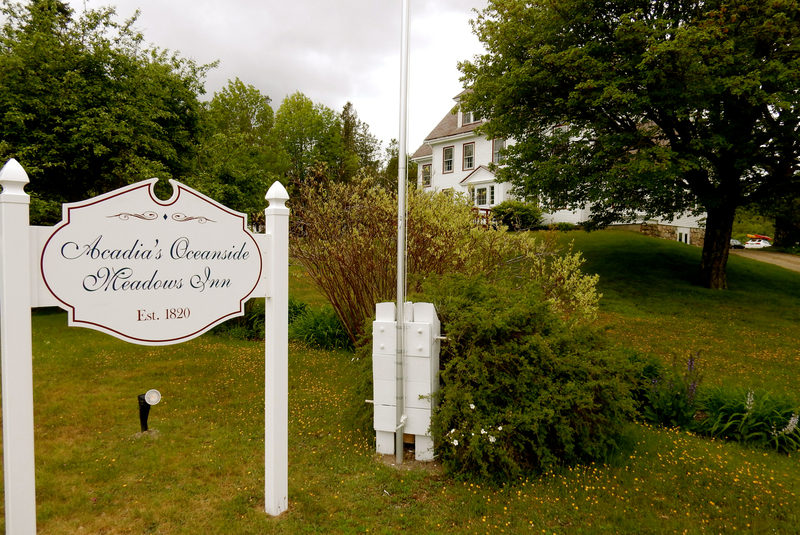 Acadia Oceanside Meadows Inn is extremely popular with nature lovers who come here just to relax, bird watch and wander the beach. Guestrooms in both the main house and the Farmhouse next door are not posh or luxe, but comfy and pretty in traditional country décor. 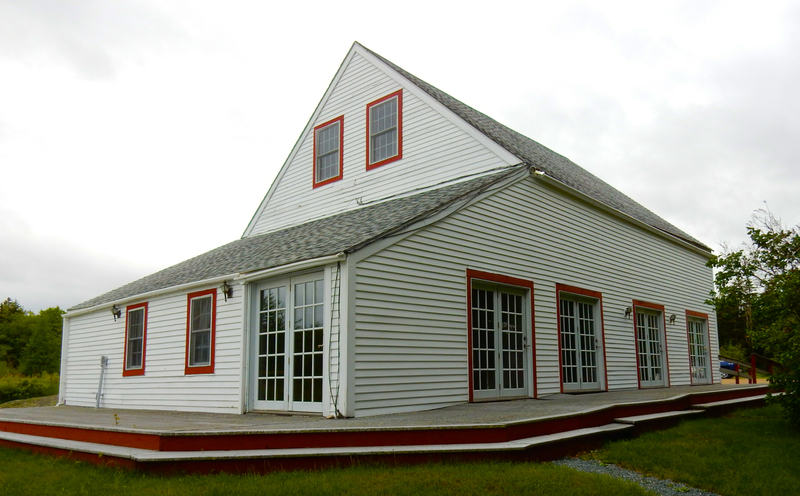 The Farmhouse served as a guesthouse in the late 1800’s when tourists started to arrive from the cities in droves. 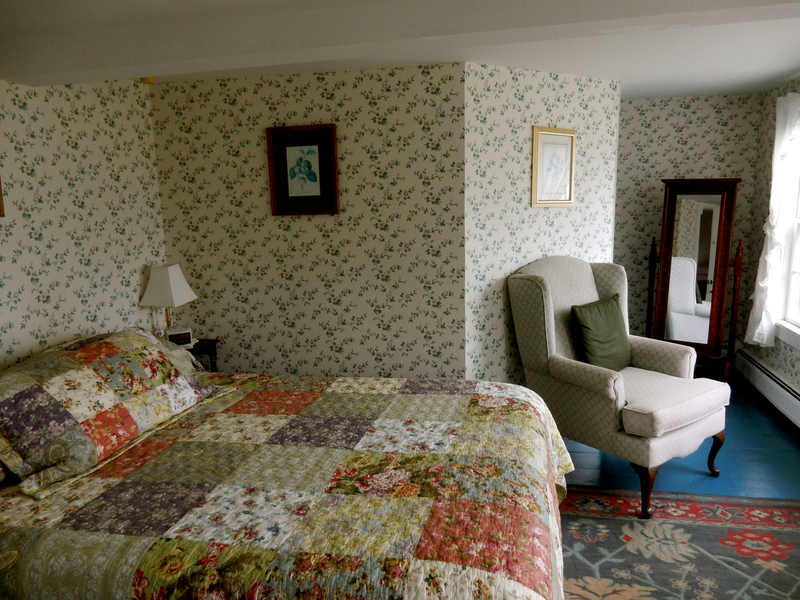 My room – #4 – had sweet Laura-Ashley type floral wallpaper and bed quilt, original wide floorboards painted bright blue, and a bank of windows overlooking the sandy, rocky cove. At night, the sound of waves hitting rocks on the beach was a wonderful lullaby. Strictly vegetarian, owners do not include meats with meals, but are happy to provide an outdoor gas grill for guests who would like to cook their own burgers or steaks. That said, you will not miss bacon or sausage in the morning when you see what comes out of the kitchen. 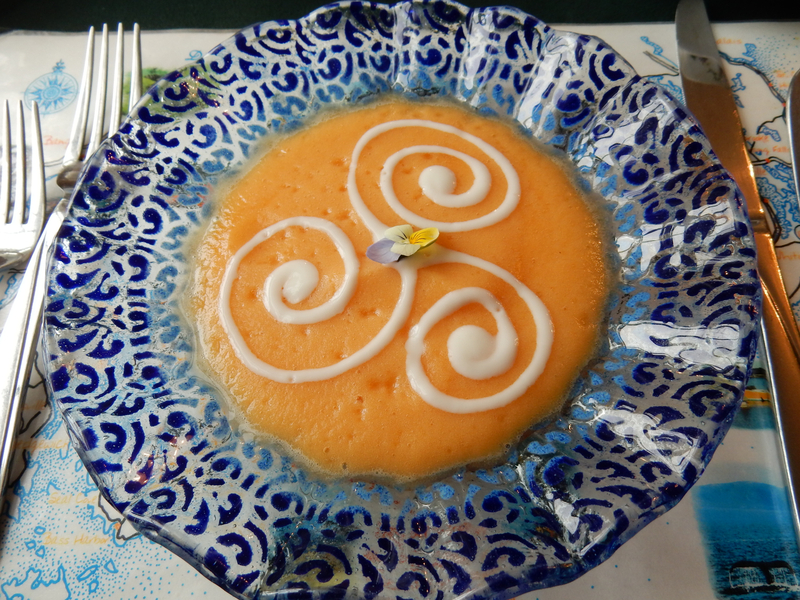 First course, the likes of Mellon-Ginger Soup served in stunning blue-glass bowls, followed by Whole Wheat Waffles with fresh berries is a feast for both the stomach and eyes. Over 200 acres of trails near a contiguous 1,300-acre preserve offers hours of hikes and exploration. Tented gazebo on the beach with lounge chairs. 130-seat hall on site for concerts, lectures and other events throughout the summer season. Amazing artfully plated gourmet breakfast. 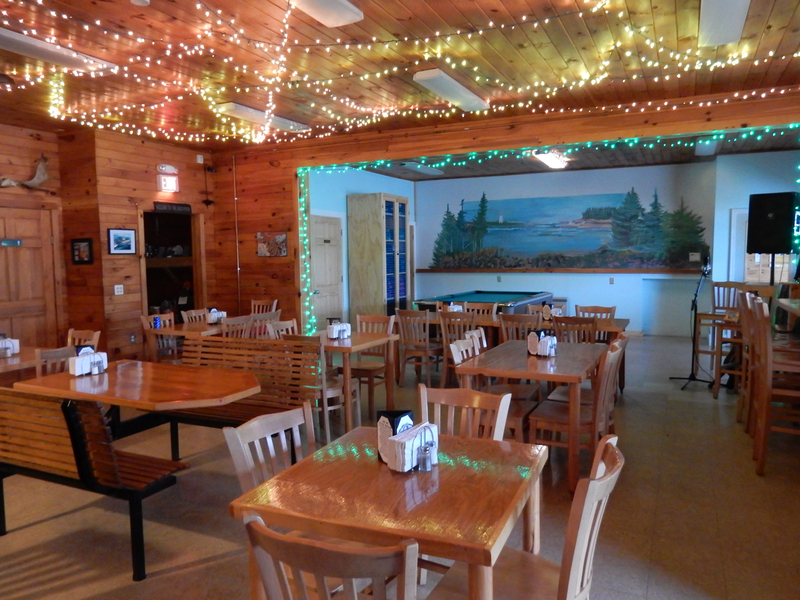 Rooms are $179 and $199 per night include gourmet breakfast, wi-fi and use of property. 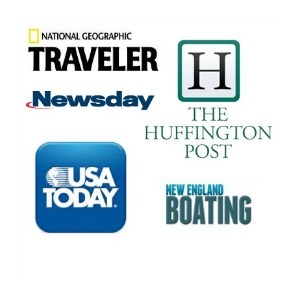 STAY: Schoodic Institute. Those who sign up for programs are in luck. The Institute can accommodate up to 200 attendees, a few in newly renovated, upscale rooms and apartments.